Oahu has it all… dormant volcanoes, turquoise waters, golden beaches, soaring cliffs and lush rainforests… and historic landmarks Aloha Tower, Pearl Harbor, Arizona Memorial and the Battleship Missouri. It’s hard to believe Oahu is the most populated of the Hawaiian Islands when you soar over the cliffs of the Pali and lush Nuuanu Valley. Oahu’s windward coastline is laced with beautiful beaches, coral reefs and impossibly steep cliffs dotted with waterfalls. Oahu’s North shore is one world-famous surfing spot after another, and inland are picturesque towns and small farms all framed by spectacular mountains. 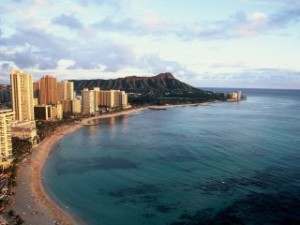 Don’t stay earthbound in Waikiki… a Helicopter Tour of Oahu will be an unforgettable adventure! Hanauma Bay on Oahu’s South Shore. Blue Hawaiian helicopter pilots are known for their experience and knowledge of the history, culture, and geography of the Hawaiian islands. Waikiki Beach, Diamond Head. Hanuama Bay, Waimanalo Beach, Kaneohe Bay, the Pali, Nu’uanu Valley, Sacred Falls. Pearl Harbor, the Arizona Memorial and the Battleship Missouri. Complimentary round-trip transportation is available from major Waikiki hotels and, for cruise ship passengers, the Aloha Tower Pier. The Helicopter: The ECO-star is the world’s first 21st-century touring helicopter. It is significantly quieter than the industry standard A-STAR and incorporates the latest cutting-edge technologies, materials, systems, and avionics. It offers incomparable passenger comfort, more interior space, individual Business Class seats, raised theater-style platform in the rear of the aircraft, and far more cockpit glass for fantastic sweeping views of the scenery below. 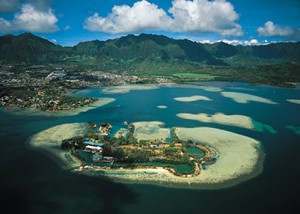 Kaneohe Bay’s blue water and coral reefs. Experience an amazing aerial tour of the island of Oahu, accompanied by experts pilots so you can feel completely at ease as you treat yourself to some of the best views and unforgettable tours around! Magnum Helicopters offers a thrilling Doors-Off Helicopter Flight from Honolulu Airport in a luxurious aircraft modeled after the helicopter made famous in the hit TV series, Magnum PI! Magnum Helicopters’ jet turbine helicopters offer passengers superb comfort, first-class audio, exceptional DVD recording and, most importantly, outstanding views of beautiful Oahu. The Helicopter: Magnum Helicopters’ helicopters are the superb Eurocopter jet turbine, six-passenger AS350. The low vibration and exceptional visibility of the A-Star allow passengers to relax and enjoy a comfortable ride and spectacular view. First Class Seating with a wider view up front next to the pilot is available for couples. Open Seating for up to 4 passengers is a bench seat in the back row. Magnum Helicopter Tours Information – CLICK HERE! Diamond Head is a tour highlight. Paradise Helicopters is the only tour company departing from the Hilton Turtle Bay Resort on the North Shore of O’ahu. Take a scenic drive out to the North Shore for this incredible aerial adventure. They offer Daytime & Sunset Tours to get your heart racing and mind blown by the spectacular mountains, waves and beaches of Oahu’s North Shore. 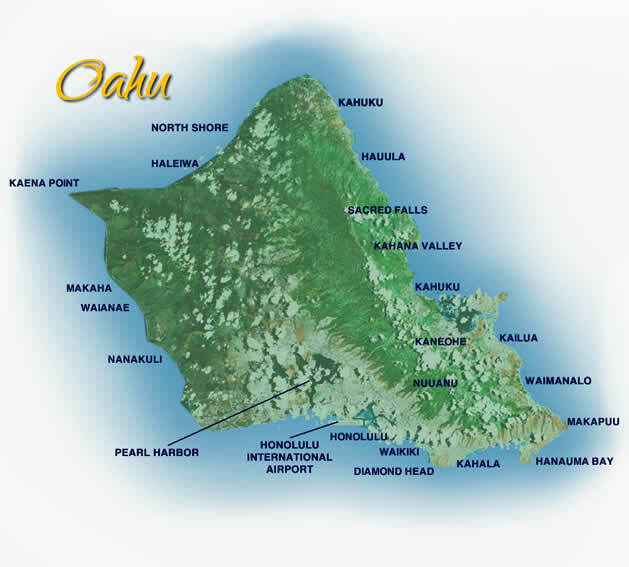 Another of their tours is the Oahu Circle Island Flight departing from Ko Olina on Oahu’s west side that includes the hot spots of East and North Oahu including the incredible 1000 foot Sacred Falls, breathtaking Ko’olau Mountains, beautiful Kaneohe Bay, and the famous North Shore surf breaks. Paradise Helicopter’s professional and safety-conscious crew will fly you by the world-famous surfing havens on the North Shore, past the staggering 1,000 foot Ali’i Sacred Falls, or over historic Pearl Harbor. With a variety of flight paths, destinations, and times to choose from, you’ll be able to choose the perfect helicopter tour for your next visit! They even offer a flight that lands in the valley that served as a movie set for Jurassic Park. Paradise Helicopter’s professional and safety-conscious crew will fly you by the world-famous surfing havens on the North Shore, past the staggering 1,000 foot Ali’i Sacred Falls, or over historic Pearl Harbor. With a variety of flight paths, destinations, and times to choose from, you’ll be able to choose the perfect helicopter tour for your next visit! Hughes 500: A 4-passenger aircraft. It offers a more personalized flight and you are always guaranteed a window seat. Known as the “Magnum P.I.” helicopter, its quick maneuverability and smooth ride gives you quite an exciting helicopter experience. Bell Jet 407: A 6-passenger aircraft has the fastest cruise speed of any helicopter on the islands, and offers unsurpassed comfort and a virtually vibration-free ride. Its oversized sliding windows offer great picture taking views, so you won’t miss a thing. 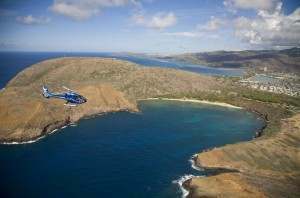 Paradise Helicopters Oahu – CLICK HERE!